The FDA recommends that every adult consume 3 servings of dairy each day. This guideline is being called into question by medical and nutrition experts alike. Milk consumption has been touted for decades as being essential to bone health. A meta-analysis of 9 different studies conducted by researchers at the University of Zurich found that milk consumption did not reduce the risk of bone fracture in men or women. In fact there is research to suggest that a high calcium diet might be associated with a high risk for fracture. There are several factors that you should take into account when deciding if milk should be included in your diet. The first consideration is weather you can digest milk properly. Lactose intolerant people lack the enzyme lactase which is needed in order to digest lactose, a type of sugar found in milk. Lactose intolerance is common among many populations, 95 percent of Asian-Americans, 74 percent of Native Americans, 70 percent of African-Americans, 53 percent of Mexican-Americans, and 15 percent of Caucasians are lactose intolerant. If you experience gastrointestinal distress, diarrhea, and flatulence, after eating dairy you might be lactose intolerant. Modern industrialized dairy products are very different from the milk of our ancestors. Even if you do tolerate milk, modern dairy products might pose a health risk to you. In order to increase milk production some industrialized dairies dose their cows with hormones like bovine growth hormone (BGH). Some the these hormones might be passed on to the cow’s milk and then to you. The presence of synthetic hormones in our diet could disrupt our hormonal function. BGH is not the only hormone found in milk. Estrogens, androgens and insulin-growth factor 1 (IGF-1) have all been found in milk. Estrogen and IGf-1 can fuel the growth of some types of tumors. Organic dairy’s are less likely to use hormones on their cows so if you want to avoid exposure to synthetic hormones organic milk may be a suitable alternative. Modern farming methods for dairy cows have increase the likelihood of them becoming ill. Industrial dairies feed cows a grain-based diet, keep them in close quarters and milk them 8 moths more out of the year then traditional dairies. This lower standard of care for dairy cows has made it more likely that a cow will become ill and need antibiotics. This concerns many people because the antibiotics could be retained in the cows milk thus exposing regular milk drinkers to antibiotics they don’t need. Pasteurization is a process used to eliminate harmful bacteria from milk. Unfortunately pasteurization also eliminates good bacteria, enzymes, and vitamins. Pasteurized milk can lose up to a 66 percent of its vitamins A, D and E content. Some people choose to drink raw, unpasteurized milk in order to avoid the nutrient loss associated with pasteurization. 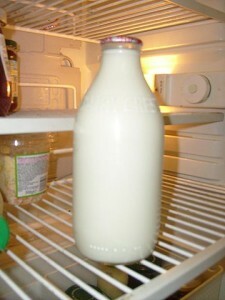 However, the use of raw milk is controversial and the sale of it is prohibited in many states. Milk is not an essential part of a healthy diet. Consuming dairy is a choice that you should educate yourself about.